Business transaction monitoring is a critical component of application performance monitoring (APM). It helps application owners get visibility into how server-side processing of the application code happens as end-users interact with web applications. Using byte code instrumentation and tag-and-follow-techniques, APM tools trace transactions through the application architecture (application servers, databases, and extern service calls) and pinpoint the server-side tier causing slowness. Then, with code-level visibility, developers can easily identify the exact line of code affecting application performance. But, although transaction tracing is a must-have for an APM tool, is it sufficient for detecting all types of application performance slowdowns? 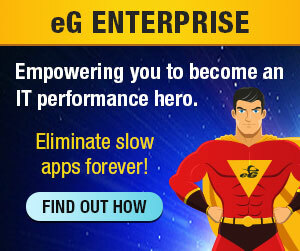 Read the eG Innovations white paper, Business Transaction Monitoring: Not the Be-All and End-All of APM, to understand how business transaction monitoring works, how far it goes, where it stops, and what level of correlated visibility of the server-side infrastructure and the application performance is needed by IT teams to effectively troubleshoot application performance slowdowns.